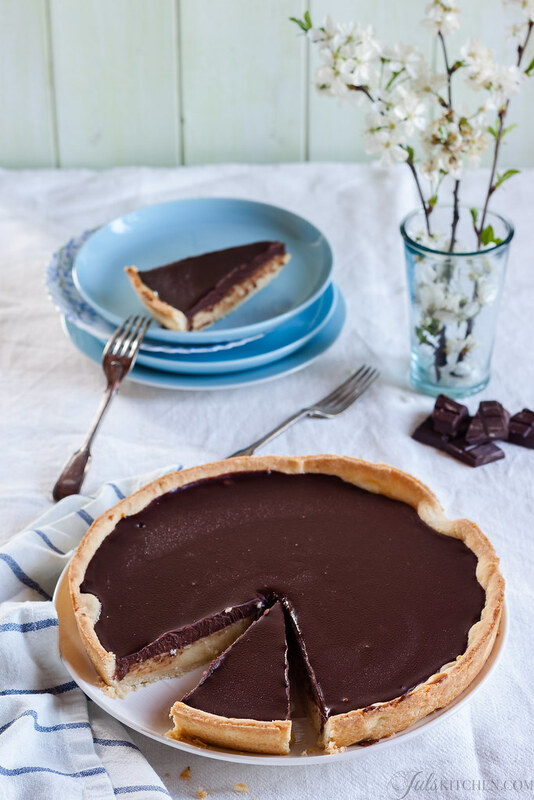 Chocolate and semolina tart to celebrate Easter and a new book I’m working on! I got off at the right stop of the metro, I walked for a while along that unknown street in Milan and I started thinking that maybe I had taken the wrong direction. She told me that I would have recognized the tower, but I couldn’t see it, just many big office buildings. I spied in every lobby I met along the way, hoping to recognize a logo, to find a sign telling me that I was in the right place. Eventually I found it, I went in in a blaze of emotion, I gave my name and they gave me back a visitor badge. “Cross the courtyard and go up to the eleventh floor”. Well, I think it was the eleventh floor, but it could have been the seventieth, I was blinded by my emotion. I went out and I saw it, there it was the RCS tower, a skyscraper that intimidated me and at the same time made me feel proud to be there. The elevator arrived and a group of people joined me in. They asked me “Which floor?” and at that moment I felt like I was in a movie. When the elevator door opened to my floor I found everything you can imagine when you think of a newsroom. Books, books and more books, people working behind their desk, colours, notes, more books. I was stepping inside BUR publisher. One hour later I left, I had a step so light that I felt like I could fly. I picked up the phone and when I called the first four people I screamed without even waiting for a reply: I’m making a book! So now I can do the same with you: I’m writing a cookbook with BUR Rizzoli! I thought it was finally time to tell you the big news, because time is flying, deadlines are approaching, the sunny days have given me a few more hours to take my photos and as usual I began a diet just when I need to try and taste from two up to four new recipes per day. In short, I need your support again, your encouragement and your patience. Because even though it will be increasingly difficult to come back here in the upcoming months, I’ll be back writing, maybe even more than before. It is a really busy and productive moment, I’m working also to develop other interesting collaborations that will allow me to give you new recipes and stories. Working on the book I found again that healthy tiredness that I used to feel when I was playing outside in the summer as a child: in the evening I drag myself into the bed, being always careful not to stumble on Noa, and I rest my head on the pillow. I stretch my legs, find my perfect position to sleep and would like to begin to list the good intentions for the next day, but usually I can never get past breakfast. I fall asleep instantly. But I fall asleep with a smile. So I’m making a special tart to celebrate! Chocolate and semolina are two ingredients that apparently have two completely different lives. The first is the king of the most spectacular desserts, dark, deep, sometimes mysterious and reserved just for the grown-ups. The second one reminds childhood, simple food, motherly cuddles. 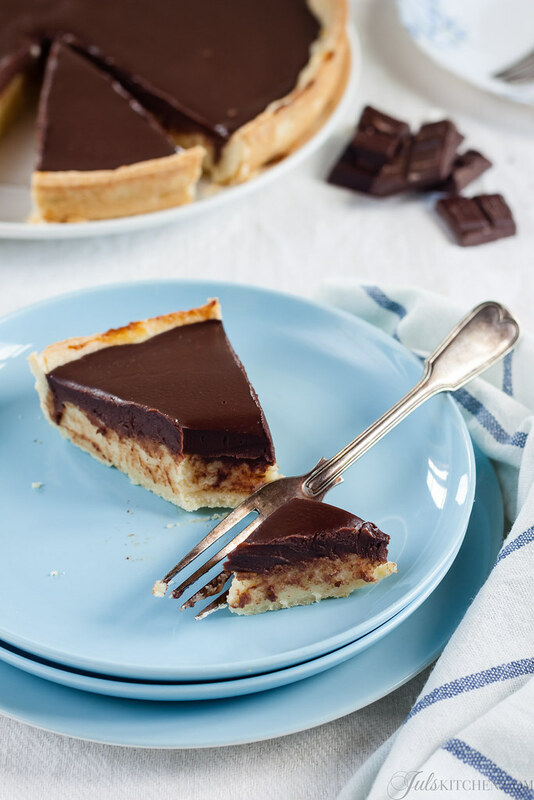 They meet and fall in love in this tart, two different layers, but well-balanced. It has a homey, familiar character, as each tart made with short pastry. I am fond of this cake. I was given this recipe by Emanuela, a friend from Florence, the same who also taught me how to make pappa al pomodoro, something for which I will be eternally grateful. It is also the dessert I ate the first night I had dinner with him. It was store-bought and taken out of the fridge at the end of the meal, but at that moment I thought it was the most delicious cake in the world, as if he had prepared before my eyes a seven layer chocolate cake. Pour the flour, the potato starch and the salt in a food processor. Add the butter cut into small pieces and mix for 10 seconds at the lowest speed. Add sugar, egg and lemon zest and mix again for 10 seconds. Now scoop out the pastry from the food processor, shape the dough in a ball and let it rest in the refrigerator wrapped in plastic film for at least an hour before using it. Make the semolina custard. Heat the milk in a saucepan and pour in the semolina making sure that no lumps are formed. Stir constantly with a whisk. When the milk reaches the boiling point, remove from the stove and let it cool, stirring occasionally. When the semolina is warm add the eggs, sugar and vin santo and whisk until perfectly combined. Preheat oven to 180°C. Remove the pastry from the fridge, roll it out to cover the bottom and sides of a 26 cm round baking dish and pour in the semolina custard. Bake the cake for 30 minutes or until the semolina custard is golden. Leave the cake to cool and make the chocolate ganache. Warm the cream and when it starts simmering pour it over the chopped chocolate. Stir to melt the chocolate and then pour it slowly over the tart. Let the tart cool completely in the fridge for a few hours before serving. Remove it from the fridge half an hour before eating to bring it to room temperature. Enjoy! Wow Juls! Massive congrats on the book! I think your blog is wonderful and it’s a real inspiration for me. I hope to move (back) to Italy over the next couple of years to really focus on mine. London life is far too busy! 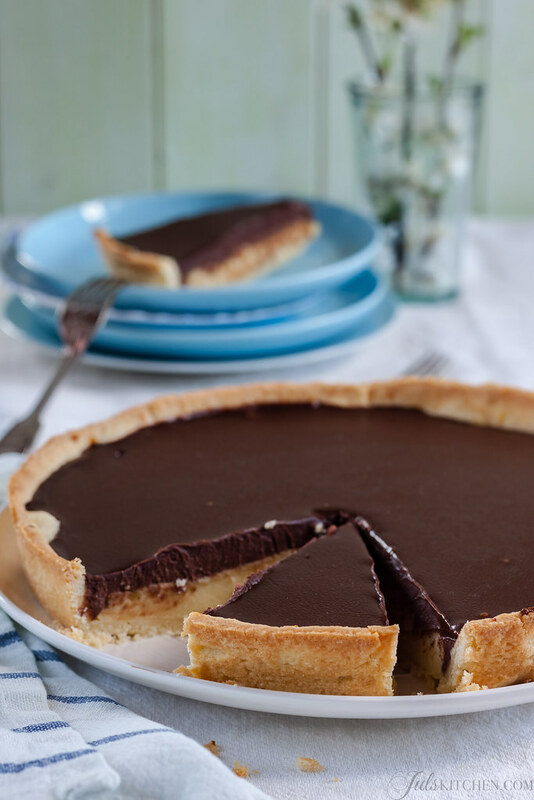 Really looking forward to trying the chocolate and semolina tart – it looks amazing. Jul’s…. APPLAUSE!! Looking forward to following your journey. Your Texas girls are so thrilled for you! Hugs!!! 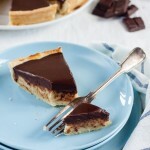 This tart looks fabulous and divine. O congratulations Giulia!!! How cool is that? And I’m sure the book will be out in other languages very soon! Whoohoo!! What great news Giulia! I found your blog after my trip to Italy last year..just luck I guess and love it. I even painstakingly convert the metric to US measures. Good luck. Congrats on your new book! Home from my wonderful Italian holiday, and I right away made a zuppa inglese for my office friends. It came out great, and everyone loved it. They want me to cook a whole meal from my Italian recipes… maybe next vacation! This tart looks delicious and sounds so interesting! I really like that semolina custard layer. I have been following your blog for quite a while, since Domenica Marchetti mentioned it in her blog. 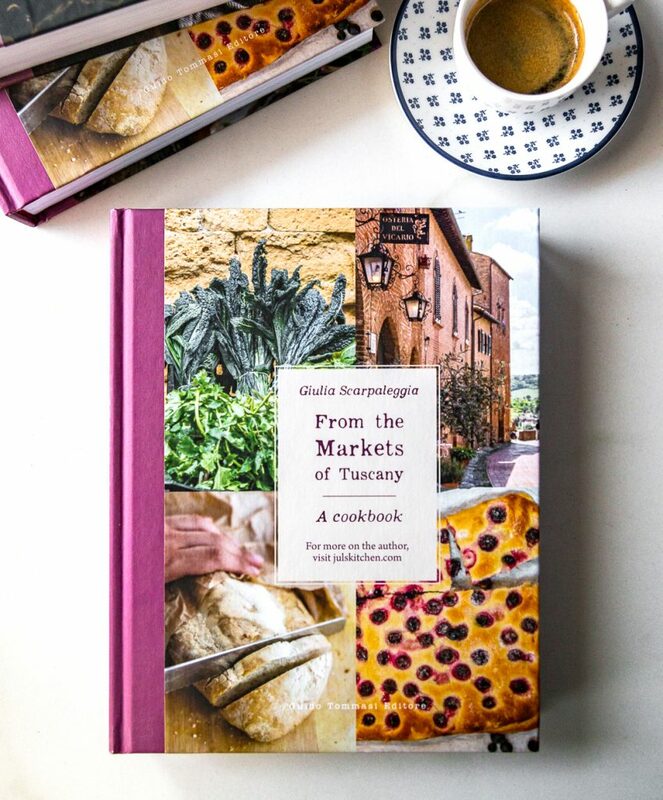 I find your recipes and your photos absolutely worthy of the new book you are ready to publish.My name might new in your blog, ma sono una romana che vive negli U.S.A. e ama la buona cucina e la fotografia artistica. Grazie per tutte le ricette e BUONA PASQUA Giulia!!!! Congratulations on your new book, how exciting. Love that your tart has another layer, the custard. Very elegant looking! previous post: Artichoke and stale bread cake. Make room in your Easter picnic basket for this!